For its Romanian’s Headquarter based in Bucharest is seeking for Travel Consultants in Leisure department. If you are looking for a career in one of the leading Romanian travel companies, you will join a team of highly skilled Travel Consultants who provide exceptional level of service to clients. You will be accountable for both individual and shared team goals, responsible for providing customer service and accurate completion of both international, domestic travel arrangements and special requests. We are looking for travel consultants with good knowledge of at least one GDSs reservation systems to the level allowing air fare searching /interpretation, advanced English skills, creativity and perseverance in searching for ticketing and outgoing services, knowledge of websites and other possible sources with best offers. We impact our customers’ travel experiences!! Act with integrity and confidentiality and protect sensitive information. The new colleague should be a proactive and positive person, flexible, client-oriented, with very good communication skills and team spirit. 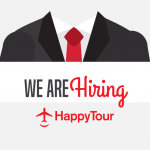 We are waiting for your application via email on daniela.toncu@happytour.ro.